Fishermen and Fisherfolks in Dominica, join the rest of the world in observing World Fisheries Day today 21st November, 2018. World Fisheries day established in 1998, is celebrated every year on November 21 throughout the world by the Fisherfolk communities. Fishing communities worldwide celebrate this day through rallies, workshops, public meetings, cultural programs, dramas, exhibition, music show, and demonstrations to highlight the importance of maintaining the world’s fisheries. World Fisheries save as an important reminder that we must focus on changing the way the world manages global fisheries to ensure sustainable stocks and healthy oceans ecosystems. 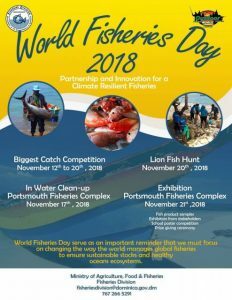 Some the activities leading up to World Fisheries Day in Dominica include the Biggest Catch Competition, Lion Fish Hunt and Exhibition to be held at the Portsmouth Fisheries Complex on 21st November, 2018.